Originally published under the title, "First We Take the Tomb (Then We Take Damascus)." Hundreds of Turkish troops entered Syria on February 21 to relocate the remains of Süleyman Shah, the grandfather of the Ottoman Empire's founder. The curious reader asked: "If Russia said, 'We don't like the location of our U.S. embassy – the area is too dangerous' and they sent out 500 troops to seize a piece of land in a better area of Washington, what would the world call this? And, with the reported influx of ISIL members into Istanbul and Ankara, will the government evacuate the cities and raze them to the ground so ISIL can't use them?" That's a very legitimate question, which will remain unanswered. Süleyman Shah's roaming tomb, for the moment, rests in peace in a Kurdish-controlled land in Syria – seized from a Syrian individual - just a stone's throw from the Turkish border, and where a contingency of Turkish soldiers is building a shrine. It will probably have to keep on roaming - inside Turkish territory - in the unwanted event that the Turkish government's peace talks with the Kurds fail. 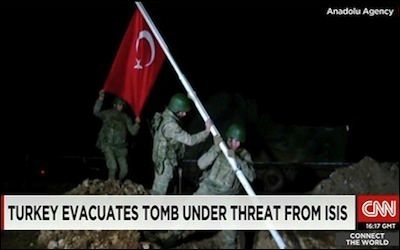 The Turkish military's heroic Operation Abduction of the Tomb exhibited its might both during and after the relocation of the sepulcher. It was not just that the army units showed their best skills in rapid construction work for a new home for the tomb, but also because they demonstrated talents in a type of warfare that is new to the Turkish General Staff: Pro-government propaganda. Photographers were reportedly barred from taking any shots showing the Turkish and Kurdish flags together. Our flagship newspaper Hürriyet reported that the photo journalists who wanted to take pictures of the heroic construction work undertaken by the military units were allowed to take shots from a certain angle only. Security? No. The soldiers were ordered to allow photo shots of the construction site "so as not to allow any shot showing the Turkish and Kurdish flags together." So, in the new Turkish military doctrine, informing groups who Ankara views as "terrorists" about a stealth military operation is fine. Receiving passive reconnaissance support during Operation Abduction of the Tomb is also fine. Relocating the tomb of a revered ancient Turkish commander to a Kurdish-controlled area is fine too. And so is the Kurdish flag proudly waving a few hundred yards away. But a photo shot showing the Turkish and Kurdish flags in the same frame is a security threat to our country! "If you dare…" Prime Minister Ahmet Davutoğlu challenged (whoever "they" are), "Come over here," pointing to the safe haven for the tomb in what is practically a Kurdish enclave. Past experiences have shown that Mr. Davutoğlu's too familiar "do-not-try-to-test-the-limits-of-our-power" rant often ends up in tragic incidents. For instance, that challenge failed to impress the Islamic State of Iraq and the Levant (ISIL) last summer when the jihadists – who are "Turkey's own Frankenstein story" - raided the wannabe empire's Mosul consulate and took 46 personnel hostage, including the consul general. It was two years after the same challenge resulted in the shooting down of a Turkish military reconnaissance aircraft by Syrian artillery or missiles. Sadly, Mr. Davutoğlu's own narrative of his country's hard and soft powers is pure exaggeration. Even worse, Mr. Davutoğlu's counterparts, especially in the Middle East, know well that this narrative is pure exaggeration. Operation Abduction of the Tomb is the best proof. If Mr. Davutoğlu's rising empire were a rising empire and had serious deterrence over a bunch of tribal Islamist maniacs would there be a threat of an attack on the roaming tomb? The tomb had to keep on roaming because it was under threat. And it was under threat because ISIL did not fear the wannabe empire's wrath. The problem is not about Mr. Davutoğlu's decision to hijack the tomb from ISIL-controlled land to a Kurdish-controlled land. The problem is about how he feels compelled to portray the story – and his country's presumed might. The Syrian diplomats tasked with officially protesting the Turkish military's incursion into Syrian territory for the operation must have giggled a lot: Under President Bashar al-Assad's control the tomb of Süleyman Shah was at least resting in peaceful land. But wait, Syrians! First we take the tomb, then we take Damascus.